THE LUNCHBOX director Ritesh Batra writes a wonderful exclusive story for EatDrinkFilms. 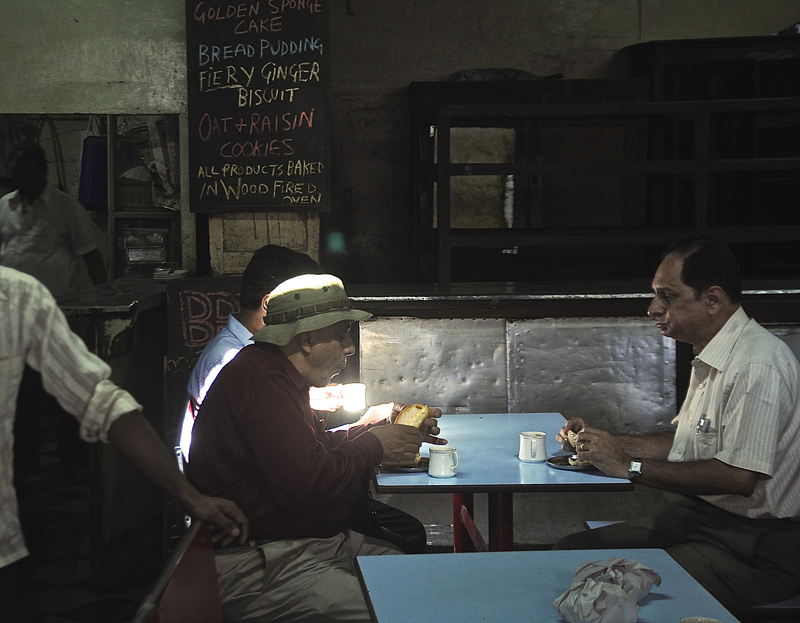 This is part II of his series on multi-generational restaurants in Mumbai, with accompanying photos by Raj Rishi More. Read Part I of Ritesh Batra’s story here. Real and imaginary patrons. Photo by Raj Rishi More. Across from the Victoria Terminus, now known as Chatrapati Shivaji Terminus, are several small and bustling bylanes. Scrap sellers, tax consultants, stock brokers, computer students—a hodge-podge of people crowd the business centers here. My father rented a desk at the Badami Business Center here when he lost his job at age 50. Just when he was about to sit back and coast the next eight years to retirement, he found himself outside Bandra station with a cardboard box—with all 30 years of his service to the company crammed inside. My mother drove up in our Fiat with my sister and me in tow to pick him up. His wallet had been picked at the station as he navigated the crowd with the cardboard box in hand. A passerby had given him the one-rupee coin to call my mother from a public phone; people were nice like that in Bombay. We drove back home in silence; there were a lot of silent drives in those days. Sometimes my parents’ somber discussions erupted into fights, my sister and I listened from our room, our ears glued to the wall. Some stray words came to us through the wall but so muffled that we were left with only volume and tone to gauge the seriousness of the situation. It was an old Bombay building with top-quality construction; the builders had used only the best materials so that you could not drive a nail through those walls, let alone eavesdrop on a conversation. My grandfather, who had regressed to his pre-partition days in Multan by then, shared a room with us. He thought we were keeping an ear out for rioting mobs. Sometimes he would put his shoes on and declare, “Enough of this cowering behind walls, I am going to Bombay, if they want Pakistan, let them have it.” “Dada, you are in Bombay.” “What? Who are you? I cannot take care of you. I have my own… Wait, let me ask my wife, if we can give you kids something to eat.” He would then call out to his wife, who had been dead for the past twenty years, leaving behind shadows in both India and Pakistan. My father rolled a dice in Bombay, just like my grandfather had, and took the desk in the Badami Business Center. I remember that Diwali when we went to his “office” to pray for the Goddess of Wealth to visit us. Mr. Khare, the accountant and his only employee, also came. Mr. Khare was pushing 75, but he and his wife had full responsibility of an adult son who was mentally handicapped. He spent much of his time worrying about what would happen to his son when both he and his wife passed away. “We are so lucky, just look at Mr. and Mrs. Khare,” my parents would tell us. When things went wrong, Bombay promptly offered up someone worse off. You could take solace in your good fortune, revel in your more-than-half-full glass of chai. 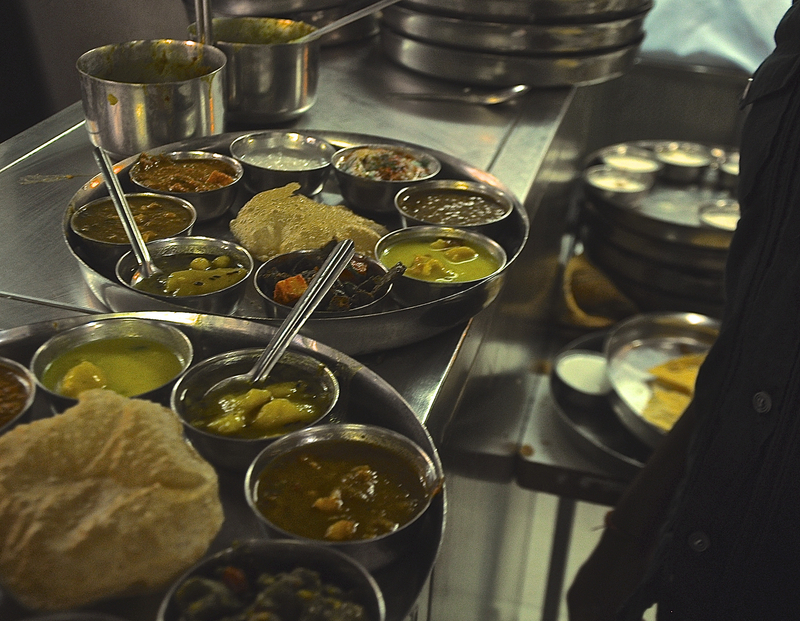 In the lane adjacent to the Badami Business Center sits Pancham Puriwallah, a 140-year old establishment, which started with just puri-aloo, but now serves a full vegetarian thali. The jewel in its crown is still the puri-aloo. The owner is the great-grandson of the founder and the family recipes have made him so prosperous that the cash counter dwarfs his frame. Three cousins run the place in three shifts, the other branches of the family have been paid off and moved into other businesses. “We don’t do too much court-kacheri like those other communities… Why destroy a good thing by fighting over it? Just take your money and go. No?” Will his children also join the restaurant business? He ponders this. “My children help out during their vacations… They can do whatever they want, except during school time and vacations.” I sip on the complimentary lassi and ponder what lies between school time and vacations. Wait. Is that man in rags, laughing and crying, patting his matted hair… Is he Mr. Khare, the accountant’s son? I never met him, but what if…? Too late, the throngs of Mumbai have swallowed him up already. Vegetarian thali at Pancham Puriwallah. Photo by Raj Rishi More. 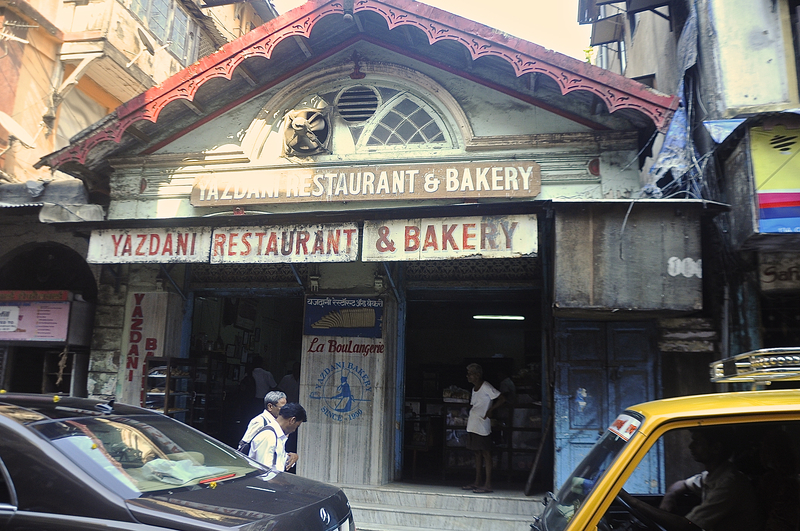 Not too far away, closer to the Flora Fountain, is Yazdani Café. Nothing has changed here since 1950. The owner, the menu, the clay oven, the ventilators, everything has stayed the same. Tirandaz, the owner’s middle-aged son, sits behind the counter. “My name is T..t..t…Tirandaz,” he stammers. “Have a brun maska, have a chai, eat whatever you want. Don’t ask me about this place… What is here? This peeling paint… My father and uncle keep it the same. For what? If you had to go for your honeymoon, would you go to a new tip-top place or an old fort? Even the guide would manipulate you there… Emperor Shivaji used to stand here… or there, they would lie to you. Why would you go to an old fort for your honeymoon?” I nod, noncommittal. “My father and uncle are very controversial people. They will suspect you if you ask them a question even. If you gave them 10 lacs, they would hand it back to you with a free pao.” He promptly vacates the cash counter when his father comes in. The father will not tell me his name. “Just take my card, it’s written there.” He screams over to Tirandaz, “The cards, the cards, they are there, you idiot, Tirandaz!” Tirandaz fumbles for the cards in the side cabinet. His father keeps on a running commentary as Tirandaz navigates the task of handing me a visiting card—“Open box, remove card, give him.” Finally Tirandaz hands me a card. It is not his father’s card, but his own. He smiles, his small rebellion. 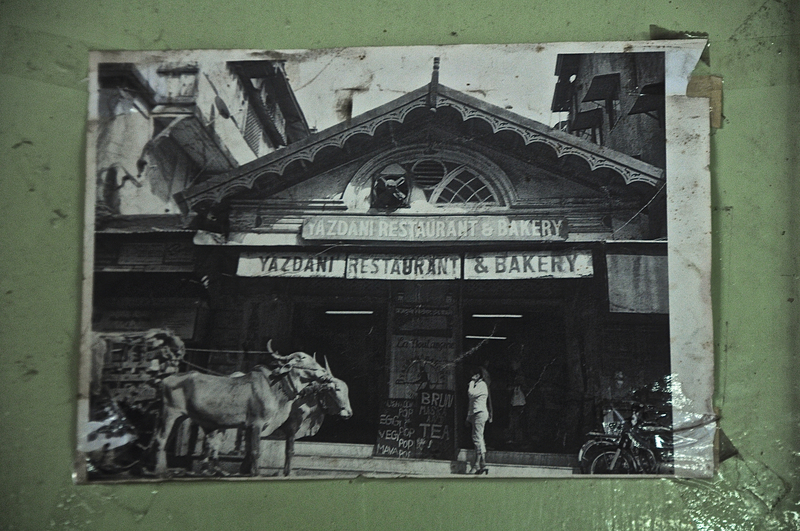 The patrons of Yazdani have seen this father-son routine before, they sip chai and eat brun maska slowly. After they are done, they will step out into Mumbai again. There are no visa requirements to go from Bombay’s shadow to Mumbai’s frenzy. Yazdani Café in the 1950s. Yazdani Cafe today. Photo by Raj Rishi More. I walk to Apollo Bunder and linger outside of the old Taj Hotel. A young couple and their 10-year-old son follow an old Saudi into the hotel. They are hesitant, but prodding the boy along, setting his well-oiled hair, making sure there are no creases on his collar. The Saudi leads, they follow. Are they pimping their child out? No, perhaps they are just giving him up for adoption. But then where is the Saudi’s wife? Surely she would be here to meet her future son? Maybe I should look into this—this is Mumbai, anything is possible. They stop for the security check—mandatory after the 2008 terrorist attack. The Saudi gently pushes the boy forward. I want to say something, to run back to Yazdani Café and tell Tirandaz he is lucky. So what if his father calls him an idiot, forces him to toil in this old café and makes him stammer, at least he didn’t pimp him out. I want to find the children of the Pancham Puriwala owner and tell them not to sweat it, summer vacations serving puri-aloo are not so bad. To the guy who runs Britannia—so what if your father calls you a rascal, and hates your Iranian wife… To the children of the Customs Officer from the 6th floor… By now the Saudi puts his arm around the boy and leads him inside the old Taj Hotel. The hotel, another shadow of Bombay. But maybe it’s not just a shadow. Maybe nothing dies. Like the sewage in Mahim Creek that flows out to sea in the day, and comes right back riding the night waves. The other day, someone, I am not sure who, first noticed that the seawater tasted sweet. Street kids jumped in and lapped it up. By evening they were bottling seawater in discarded plastic bottles and peddling it at traffic signals. Word spread, and people with arthritis, psoriasis, and other assorted conditions came down to partake in the miracle of the sweet seawater. Parents dunked their sick babies in the sea despite their cries. Some even dunked their healthy babies, hoping they would emerge gifted geniuses. By night the Brihanmumbai Municipal Corporation had tested the sweet seawater and found that the miracle was nothing but a chemical reaction between some industrial waste and seawater. It was a wonder then that thousands had not ended up in the hospitals after drinking sewage. It was simple really, most people had just sipped on the miracle water tentatively, and saved the rest for a rainy day. For now, their glass was more than half-full. Ritesh Batra was born and raised in Mumbai, and is now based in Mumbai and New York with his wife Claudia and baby girl Aisha.His feature script THE STORY OF RAM was part of the Sundance Screenwriters and Directors labs in 2009. His short films have been exhibited at many international film festivals and fine arts venues. His recent Arab language short CAFÉ REGULAR, CAIRO screened at over 40 international film festivals and won 12 awards. Raj Rishi More is a Photographer based in Mumbai. He studied photography from Drishti School, Bangalore. His short film THE LAST DRIVE was awarded the Jury Award in the Bangalore Short Film Festival. He worked as an Assistant Director for Ritesh Batra’s debut feature THE LUNCHBOX and for his short film MASTERCHEF. This entry was posted in Eat, Films and tagged chai, Eat, EatDrinkFilms exclusive, Films, Indian, multi-generational, Mumbai, restaurant, Ritesh Batra. Bookmark the permalink.